Jacqueline 1961 No. 2210 cream satin evening gown that is sometimes referred to as the " Inaugural Gown". 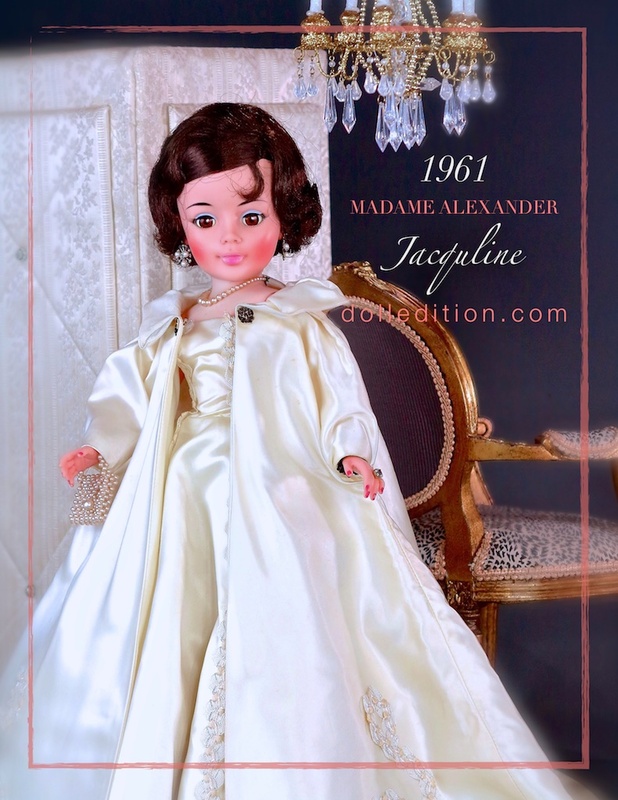 "Jacqueline" by Madame Alexander arrived as a replacement for the extremely popular fashion doll "Cissy." Introduced in 1955 by Alexander, "Cissy" was a hard plastic doll with an intriguing group of sophisticated hairstyles translated as wigs. By 1957, the doll competitors were switching over to vinyl fashion dolls with rooted hair. This enhanced the very popular play activities of washing and setting your dolls hair. "Cissy," like most of the other wigged dolls by Alexander, were advertised as being able to "wash and set" your dolls hair. They often included rollers, a comb and inductions in the hat box that came with the larger dolls. This was a bit of a stretch. The "wash and set" capabilities were not the strong point of these beautiful dolls by Madame Alexander. Unlike Toni and the Revlon Doll, not only did they produce the better play doll, they also had a strong product tie-in with their dolls. "Jacqueline," arriving in 1961, was a 21-inch doll with a hard plastic body, vinyl arms and head with rooted hair. Unfortunately, the beautifully executed and costumed doll was arriving just as "Barbie" was taking over the doll world with her own fashion revolution and lower price points. These price points were a big part of "Barbie's" attraction to both children and their parents. Even tied into the immensely popular first lady Jaqueline Kennedy, the doll was the right doll, just not at the right time. Regardless, "Jacquline" is beautifully costumed fashion doll using elegant fabrics to capture the change of direction fashion was taking in this new decade, Only available for a year and a half, "Jaqueline" marks an important mile stone in both design, technology and the development of the mid-century fashion dolls created by Madame Alexander for the baby boom generation. Madame Alexander had to develop the mold, refine their vinyl to accommodate the sophistication of the subject and develop the process of rooted hair that was done in an adult hair style that could be repeated on thousands of dolls. First Lady Jacqueline Kennedy and her January 1961 iconic ivory inaugural gown and cape. Oleg Cassini sketches for the 1961 inaugural gown of Jacqueline Kennedy. With all the planning and product development that went into Jacqueline, while a stunning doll, she did not go over well at the time as a 1961/1962 fashion doll.